On Monday, the DNC will kick off its convention in Philadelphia, where Hillary Clinton is presumed to clinch the Democratic presidential nomination. Expected speakers at the DNC convention include President Barack Obama, Lena Dunham, Sen. Bernie Sanders, FLOTUS Michelle Obama, VP Joe Biden, and former POTUS Bill Clinton, all of whom are important and much-needed supporters to sustain a firm foundation with the voter base. But there are two groups making an appearance who you might not have heard of and could turn out to be the main event. The first is United We Dream — namely Astrid Silva, an activist for the group — a youth-led immigration reform organization. 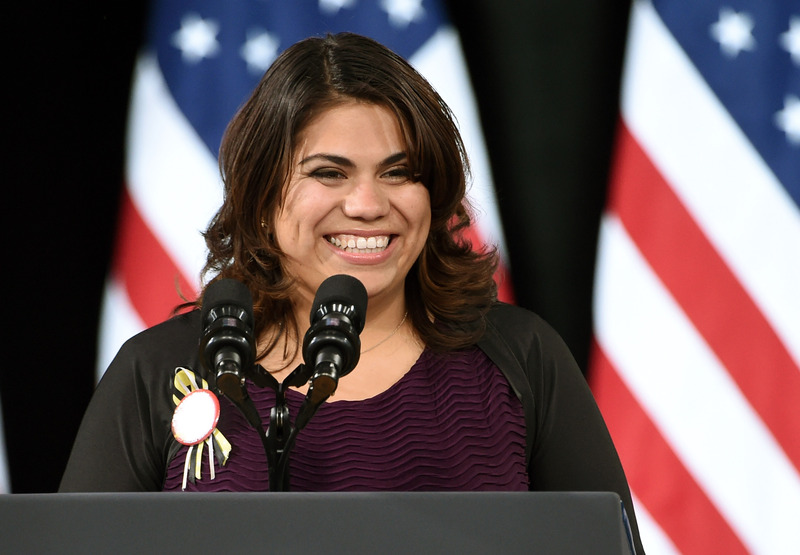 She's not yet a household name, but her heroic story has won the hearts of powerful politicians and on-the-ground immigration reform organizers alike. Originally a Mexican immigrant and currently living in Nevada, her political story starts when she made a bold move and found an unsuspecting friend in Senate Minority leader Harry Reid after she slipped him a note in 2009, according to a report from the Los Angeles Times. In her letter she detailed the struggles of her immigrant family and asked for help for others like her. In a heartening twist, he actually responded and took her cry seriously. What's more, Reid stayed in touch with Silva and eventually got her story to the president. That story made her a headliner when she first was mentioned by President Obama during an immigration speech he made in 2014, earning her the nickname of the "poster child of immigration reform." As the story goes, Silva came to America with nothing but "a cross, her doll, and the frilly dress she had on," according to the Obama speech that put her on the map. Now, she's rubbing elbows with some of the most powerful politicians in the world and, in a powerful comeuppance, this underdog will be on the national stage representing the issue she's been fighting for in support of the presumptive Democratic presidential nominee. The second group you might not have heard of, but is sure to pack a powerful punch, is Mothers of the Movement organization. It's a group founded and composed of black mothers who have lost children because of police brutality and gun violence. Now they're using their pain for change and utilizing the newfound platform to advocate for police reform and gun control, the issues that ultimately failed these women and cost them a child. Speakers from the group will support the Democratic candidate on Tuesday, including Gwen Carr, mother of Eric Garner; Sybrina Fulton, mother of Trayvon Martin; Maria Hamilton, mother of Dontré Hamilton; Lucia McBath, mother of Jordan Davis; Lezley McSpadden, mother of Michael Brown; Cleopatra Pendleton-Cowley, mother of Hadiya Pendleton; and Geneva Reed-Veal, mother of Sandra Bland. Watch this video created by the group explaining their support of the nominee. A name that wasn't expected to be on the list that was just announced? Massachusetts Sen. Elizabeth Warren. The DNC left her off the initial list of speakers and many thought that was a sign that she would be a potential VP pick. Now that she's been announced as a speaker, it's likely she won't be Clinton's running mate. Enlisting the two minority groups, United We Dream and Mothers of the Movement, is presumably an effort to woo two of the most coveted demos of the 2016 election: black voters and Latino voters. And although they're not as well known right now, after the convention, they could be household names.